The Villa Monteleone winery is the dream of Chicago neurosurgeon Anthony John Raimondi and his Colombian wife Lucia. The couple moved to Italy 16 years ago, first to Liguria, then Tuscany, finally settling in the Veneto, at the end of the 1980’s. They had the immense fortune of stumbling upon the Villa Monteleone, a villa and wine cellar from the XVII century and immediately fell in love. They sought advice from highly regarded French and Italian winemakers, but also the council of the locals as they wished to produce absolutely typical products of the region. They began to cultivate 8 hectares of vineyards and re-equip the cellars. 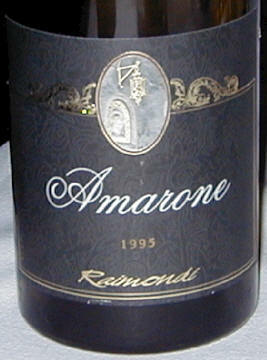 They produced their first vintage of 3,000 bottles in 1989. Today the cellar produces about 45,000 bottles of all the typical wines of Valpolicella. Mr. Raimondi, who was affectionately known as "The Professor" by the locals, passed away in 2000. The estate is currently owned by Marco, Paolo and Laura and the winemaking tradition is carried on by Lucia. The wines are described by Gambero Rosso as having "elegance, charm and a strong link with the past" that stylistically "hover somewhere between tradition and modernity". 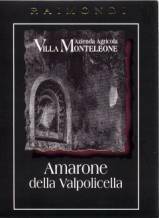 March 15 - Raimondi Valpolicella 2001- RM 83 $45 - A bit funky with a musty wet earth nose and dirty mushroom taste that overshadows the over-ripe raisin blackberry taste. Tasted w/ Dr. Dan at the United Center Stadium Club.